The Yamasaki TPU Series Intelligent Power Meter is the latest design in Multiple Wavelength Optical Power Meter Technology. The InGaAs detector is pre-calibrated for 850, 1300nm for Multimode and 1310, 1490, 1550nm and 1625nm for Singlemode wavelengths. The TPU series supports Wave ID which allows the power meter to automatically detect the incoming wavelengths transmitted by the TLU series Intelligent Laser Source and adjusts itself accordingly. The InGaAs detector is pre-calibrated for 850, 1300nm for Multimode and 1310, 1490, 1550nm and 1625nm for Singlemode wavelengths. The internal memory holds up to 1000 results which can be downloaded through the USB port and onto the PC with the included reporting software. The Yamasaki TPU Fiber Optic Light Source also features an ambient light sensor which allows the LCD to automatically adjust to the brightness of your surroundings. The Yamasaki TPU Series Intelligent Power Meter is the latest design in Multiple Wavelength Optical Power Meter Technology. The InGaAs detector is pre-calibrated for 850, 1300nm for Multimode and 1310, 1490, 1550nm and 1625nm for Singlemode wavelengths. The TPU series supports Wave ID which allows the power meter to automatically detect the incoming wavelengths transmitted by the TLU series Laser Source and adjusts itself accordingly. 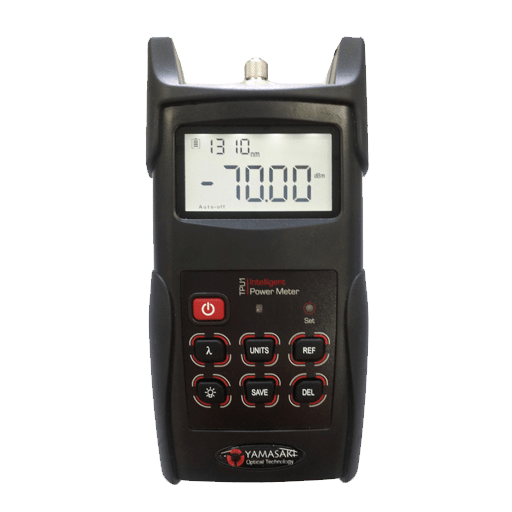 Additionally the TPU series has the ability to identify tones generated at 270Hz, 330Hz, 1KHz and 2KHz to assist in fault finding and fiber location. A universal connector for FC, SC and ST is included, with an LC connector available upon request. Results are able to be displayed in dBm, dB and W to ensure you can achieve all testing required. With an included AC adapter he Yamasaki TPU Series Intelligent Power Meter can be ran on batteries or AC power, for portability and ease of use.